Originality is a goal not only in literature and art, but also in business and certainly in the startup community. We often use different terms such as ‘differentiation’ or ‘innovation’ for originality but the concept is the same, offering something to the world that is distinguished in small or large ways. Just as innovative new products are usually the result of a combining old things in new ways, people with originality skills combine various habits in ways that result in more frequent creativity and impact. We are a sum of our habits, so establishing and refining habits in ways that result in new ideas is important for those who wish to express creativity in their work. I’ll draw on some examples from business to depict five habits of originality. I take significant inspiration from Originals: How Non-Conformists Move the World by Adam Grant. Seek and speak truth – Bridgewater and its founder, Ray Dalio, are famous for being a successful investment fund and for having a focus on company culture based on an articulated set of principles. Principle 1 is Trust in Truth. Truth isn’t just about avoiding lies, its about being transparent and developing a capacity for constructive criticism. Mistakes happen in business every day, even more often when working on something new. Anything less than truth when dealing with mistakes leads to an inability to learn from mistakes, fatal for businesses but also for your capacity to get better and grow. Engage your mind by using your body – Something as simple as taking a walk can stimulate the mind better than sitting for hours on end staring at a computer screen. 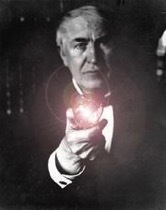 Thomas Edison famously dismissed golf as exercise in saying that he got more exercise in walking through his lab from table to table and was able to keep his brain working well at the same time. The brain is about 2 percent of body weight but consumes about 20 percent of a person’s total energy. Shifting some energy requirement back to the rest of the body can help bring new mental energy. I used to go on noon runs with an entrepreneur who loved to work through business issues while on the run. It was an extremely challenging workout for me because he ran at a faster pace than I typically did, but also because he forced me to carry on a conversation the whole while! Engage people – Talking through ideas with others is a great habit for those working on challenges. An entrepreneur I know tells the story of explaining his new business idea to a well-known and successful businessman. After 4 meetings, the entrepreneur started to question the reputation and intellect of the businessman, as he asked very basic questions again and again and again about the entrepreneurs new business idea. On the fifth meeting, the businessman again asked very basic questions about the entrepreneur’s new business idea. Exasperated, the entrepreneur gave one more try to explain the business idea. By the end of that day’s conversation the businessman smiled and told the entrepreneur that he had finally evolved the business idea to the point where it might be interesting. His repeated questions weren’t from a lack of comprehension. Rather they were pushing the entrepreneur to more fully think through important parts of the new business idea. Socratic business development perhaps, but a powerful example of the mental iteration and evolution that can occur just buy talking to people. Especially talking to people who ask good questions and challenge your assumptions. Learn about new domains – Originality often flows from specializing in a trade, task, or skill. In the book Outliers, author Malcolm Gladwell writes that it takes roughly ten thousand hours of practice to achieve mastery in a field. Though this is disputed by many, I certainly buy the idea that getting really good at something takes time and effort. A counter idea to the concept of complete specialization, however, is that many creative originals take time away from their primary occupation and art to learn about new and unrelated things. Meredith Perry of uBeam started out to create a wireless means of electricity transmission by being told by professors, physicists, and engineers that it was impossible. While commercial success for uBeam may or may not come, Ms. Perry exhibited tremendous creative capacity in domains in which she had little or no expertise. While learning new things is challenging, often un-learning things you think you know is the bigger hurdle. Respect the status quo but question it brutally – The core of creativity involves introducing new things to the world. The default for originals is to question the status quo. Just because it’s always been done that way doesn’t mean it always will. The savvy original, however, will at least respect the status quo. The world works that way it does today for a complex set of reasons. You may not agree with those reasons, but you have to at least understand them. For the new and creative to win, you must be able to navigate past barriers and resistance effectively. My friend Kevin Maher started Global Vet Link with a goal of transitioning animal health certificates from being paper forms to electronic. Easy right? The challenge was that state veterinarians govern animal health certificates and had to approve this change in regulatory model. The Iowa state veterinarian didn’t buy-in initially (Global Vet Link’s home state) so had to start with Florida as state number one. Kevin’s great persistence got all 50 states onto the Global Vet Link platform, but it also took a great patience and understanding of the status quo in order to finally change it. What habits of creative, effective people do you admire? What is most important for you to work on and develop as a habit? The beginning idea for a startup business is only part of what’s necessary to get to a viable business, but it certainly helps to start with a quality idea. So how should aspiring entrepreneurs both come up with and evaluate the potential of new business ideas? A tool I’ve developed to help students evaluate their own and other student startup ideas is the Startup Evaluation Matrix. It also serves as the rubric by which I formally evaluate and grade new startup business concept papers. In addition, I increasingly use it when speaking to aspiring entrepreneurs from outside the course who are looking for feedback on their ideas. Each of the elements of the Startup Evaluation Matrix reflects a yin and yang relationship; complementary, interconnected, and interdependent forces that shape its attractiveness. This balance in a startup business idea is difficult to shape, yet one that consistently comes through in the most attractive startup concepts. Migraine Problem/Value to Customer – I use Diana Kander’s all in startup book’s notion of a problem that represents a significant opportunity, a migraine problem. A business needs to solve a problem so significant that customers will do whatever it takes to solve it, including paying someone else for a solution. Envision the problem as a migraine headache. The flip side of the problem is the value of the solution to the customer. Does the solution have a clear and significant advantage? Does it hit the ‘homerun’ of being better, faster, and cheaper? Does the solution deliver value while making life simpler for customers? So many technology startups miss this mark in that they may be able to solve a problem, but they are so complex or require such significant changes in behavior that they simply will never be considered viable by most prospective customers. Niche Now/Big Market Potential – Peter Thiel in Zero to One writes that entrepreneurs need to look for ‘monopoly’ opportunities; markets where they can shield their businesses through various means from competition that will bid their profits to zero. I think of attractive market opportunities for startups as being markets that are niches currently, but with the potential of big growth. When we started E-Markets in 1996, there was not really a market for Internet-based electronic applications in the agribusiness space. However, the Internet was new as a platform, and clearly had significant growth potential as a better, faster, cheaper platform for e-business. Today I see agricultural entrepreneurs working on indoor aquaculture, robotics, diagnostic software, and other areas that have an undefinable market opportunity today, but huge potential in tomorrow’s market. Doable Now/Unique Solution Long Term – Rarely is their something completely new, whether a technology, production system, product, service, or method. Rather, entrepreneurs combine old things in new ways, and new places to create new solutions to new audiences. Quality startup ideas balance the do-ability of a new solution near-term with its long-term uniqueness. A startup that will truly scale can’t be a copycat, it must aim to solutions that are unique and represent the target for which copycats aim. Contrarian/Surprise Element – An attractive startup idea has some element that is contrarian. It is treading left while everything else is treading right. Perhaps that arises from the independent-minded nature of entrepreneurs who chart their own course. The contrarian nature of interesting new business ideas also lends an degree of surprise or unexpectedness. The highest impact startups will be something that could not be predicted by most people. The innovations that disrupt an established market will be initially dismissed by businesses that will eventually be put out of business. In 1996, I was involved in a consulting project for Kodak. The Senior VP we worked with dismissed the strategic threat of digital cameras. Kodak was the first company to market a digital camera in the 1990s, but ignored the opportunity enough that its business was knocked from beneath it and filed for bankruptcy in 2012. Deciding the quality of a startup business idea is more art than science. Malcolm Gladwell’s Blink explains that choices that seem to be made in an instant-in the blink of an eye-actually aren’t as simple as they seem. I know great investors and entrepreneurs that very quickly assess a startup idea, a business plan, or the viability of a new product or service. I suspect that they have some kind of internal matrix-like structure that enables them to make snap judgements that are most often on-target. Their mental matrix has been developed based on experience, but I’ve found that the Startup Evaluation Matrix is a means to embed a beginning way of thinking for less experienced entrepreneurs too. How would you apply the Startup Evaluation Matrix to the following new agricultural businesses? Which of these business concepts holds the most promise? Why? Cybernated Farm Systems – CFS has designed Off-Grid Smart Aquaponic Greenhouses that will benefit people from the first to the developing world. Tiny Farms – Tiny Farms is building a platform for the production and distribution of insects as commodity agricultural products. Vital Herd – Vital Herd has developed a solution that captures each animal’s vital sign data and transmits it to a cloud platform for analysis. Barn2Door, Inc. – A discoverable marketplace where anyone can buy or sell clean, sustainable food. Iron Goat – Iron Goat is an agricultural robotics company with an autonomous self-fueling hay harvester technology. I’ve been a fan of David McCullough’s books for a long time. He’s an historian who knows how to build a highly readable story from solid research. History is often more vivid than fiction, as you can’t make up some of the funny/crazy/amazing things that people have done through time. I recently read McCullough’s new book, The Wright Brothers. While familiar with Wilbur and Orville Wright as inventors of the airplane, I wasn’t familiar with the details of their pathway to legend. It wouldn’t have been labeled as such in the first years of the 20th century, but the Wright Brothers effectively operated as a startup from 1900 to 1903 when they made their first successful flight with a self-powered machine. The term ‘startup’ has been used for a while, but certainly has come into prominence in the last twenty years. Today’s entrepreneurship programs at universities, incubators, accelerators, and entrepreneurial community-building efforts underscore the cultural prestige of startups as a means to innovation, job creation and professional fulfillment. But is there something completely unique to our era about startups? A reading of The Wright Brothers indicates to me that the answer to that question is no. Wilbur and Orville Wright may not have termed their research project and later business a startup, but their activities that resulted in the first airplane shared all the characteristics of what we call startups today. Peter Thiel says that entrepreneurs are looking to uncover the world’s secrets. The insight the Wright Brothers developed was based on their opinion that a reliable method of pilot control was the key to successful, safe flight. At the outset of their experiments about 1900 they regarded control of an aircraft as their key aim. There was promising knowledge and development in wings (lift) and engines (power) but nothing related to control. Most experiments in human flight up to that point in time resulted in laughable or tragic failures. The Wright Brothers’ methods of wing warping and a rear rudder were eventually awarded a patent, and provided the template for airplane control that lasts to this day. The Wright Brothers gained very little through existing theories or basic research. Rather, they developed the first powered airplane through years of trial and error. Their pathway was through flying kites, carefully watching different kinds of birds in flight, building models, building a wind tunnel, and finally traveling for three straight years from their home in Dayton, Ohio to Kitty Hawk, North Carolina to try their planes. Theirs is another example of theories following invention, not the other way around. The Wright Brothers used some of the mathematical aerodynamic theories that had been developed with their second prototype, but they were wrong and a tremendous frustration to their efforts. Articulate theories on why an airplane works the way it does emerged after the invention. The Wright Brothers weren’t the only ones working on airplanes. The Secretary of the Smithsonian Institute, a very prestigious position at the time and a PhD, Samuel Langley, had been working on a project for a number of years. The Langley project cost $70,000, the greater part public money, whereas the Wright Brothers expenses for everything from 1900 to 1903 was less than $1,000, paid entirely from the modest profits of their Dayton, Ohio bicycle business. The Wright Brothers produced a working airplane, Langley did not. The Wright Brothers in the long-term (and with 20/20 hindsight) could have done much better at building an organization to take business advantage of their invention. However, during their startup period, they did very well at including the right people at the right time. Charlie Taylor ran their bicycle shop in Dayton while they were working on the airplane, but became an indispensable part of the team when they turned to construction of an engine for the machine. He developed what may have been the first aluminum block engine ever, this in the very early days of gasoline powered internal combustion engines. It was vital that it be light, and the bicycle mechanic came through with a solution neither Wright brother would have been likely able to do themselves. The Wright Brothers, and the idea of manned flight, generated all kinds of debate at the time. Prestigious scientists, professors, and even Scientific American published numerous articles denouncing either the general idea of a workable airplane or specifically the Wright Brothers project as word spread. The press, the U.S. military, even the local Dayton Newspaper (for a time) were openly skeptical. Key people, some close to the Wrights, others not, were strong believers, however. Disruptive ideas and projects generate both strong skepticism and belief, then as now. 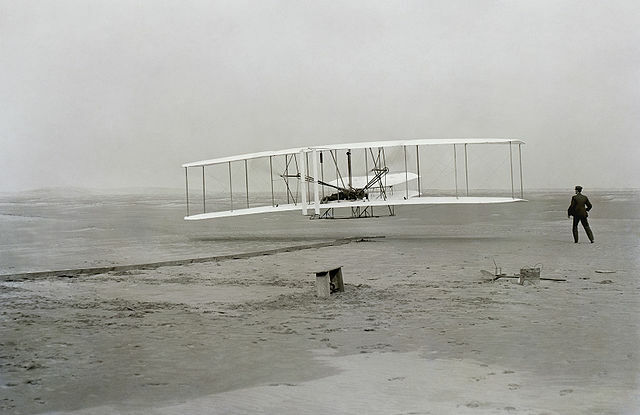 Wright Brothers First Flight, December 17, 1903. Orville piloting. Wilbur at the wing. Whether manufacturing becomes of greater or lesser relative importance in China than in the United States, it is certain that there will be need for a constantly increasing agricultural production, and that the fullest utilization of the arable land consistent with a permanent agriculture should be a major concern of the Chinese government.. I recently published a paper with the Paulson Institute, Opportunities for US-China Investments in Agricultural Innovations and New Technologies. The paper outlines four models that can link US and Chinese investment activity, particularly private sector investment, to help yield productive new avenues of commercial collaboration. All four models focus on animal protein supply chain technologies. That is because agricultural innovation in this realm is of particular importance to demand side developments and rapidly changing consumption patterns in China. The models focus on early-stage agricultural business development activities, representing a new element of US-China private sector engagement. Although mergers and acquisitions (M&A) between US and Chinese agribusiness and food companies—for example, the acquisition of Smithfield Foods by Shuanghui—may continue to be an important part of strengthening agricultural ties, collaborative early-stage commercial activity promises to deliver more enduring impact. Connecting investors, business people, and entrepreneurs from both countries has the potential to build collective knowledge and imagination, resulting in greater indigenous agricultural innovation in both countries. The United States has in many ways set the global standard for agricultural innovation. And China, for its part, has made significant strides in agricultural productivity as well. China continues to both rapidly integrate innovations from abroad and to develop homegrown innovations. But is the rate of agricultural innovation adoption in China rapid enough to meet the growing food needs of a huge and increasingly wealthy population? The average family in the United States today spends 10 percent of its disposable household income on food, while that figure is double in China. Both of these figures have declined over time—in the United States over an extended period, and in China more dramatically in the last thirty years. When families spend less of their income on food, it represents a relative gain in prosperity as disposable income can then be spent on other necessities, leisure, or luxury items. The decline in food prices is directly related to the rise of agricultural productivity over the last thirty years. The key factor responsible for such significant gains is innovation, not just previous gains from input intensification and crop-area expansion. It takes significantly fewer resources today to produce one calorie of food than it did in the past, with much of the credit for that improvement attributable to agricultural innovation. For this reason, investment in agricultural research and development (R&D) is an important driver of agricultural innovation. But while public sector spending on such R&D is important to both the United States and China, it is private sector investment in both R&D and commercialization that will determine the ultimate effect of future agricultural innovations. This raises an important question for the United States and China: are there opportunities to link private sector investment activity in agricultural innovation and connect the agricultural innovation engines of the two countries? This paper suggests four models could link US and Chinese private sector investment, and thus yield productive new avenues for commercial collaboration. All four models focus on animal protein supply chain technologies. That is because agricultural innovation in this realm is of particular importance to demand-side developments, and rapidly changing consumption patterns, in China. Model One: Joint Agriculture Fund. Such a fund, backed by US and Chinese equity partners, would have an explicit focus on investing in businesses with technology relevant to both the United States and Chinese animal protein supply chains. Chinese investors would be limited partners in the fund itself, but personnel with deep experience in, and perspective on, Chinese agriculture would help to bring unique capacity to the fund’s portfolio companies. The goal would be to help them scale portfolio businesses in both the United States and China. Model Two: Joint Agriculture Accelerator. In this model, Chinese investors would partner with a US-based organization to start a US-China Agriculture Accelerator. Such an accelerator would provide participating businesses with office, laboratory, and/or engineering space, as well as access to mentors, skills training, a support network, and ultimately connections to investors and customers. The joint accelerator would, as is customary, often take an equity stake in businesses that participate in the program. Model Three: University Student Incubators. In this model, US and Chinese investors would help to create student incubators at US universities, with the explicit goal of supporting development of startup businesses created by teams of both US and Chinese university students. Startup businesses that emerge from this student incubator would have market potential in both countries. Model Four: Emerging Africa Agriculture Fund. This model would combine Chinese and US investors (and potentially third-country investors), as well as agribusinesses from both countries, into partnership active in third countries where agricultural development is a pressing need. One opportunity that stands out is the prospect of investment in greenfield agriculture projects in Sub-Saharan Africa. Such a fund would aim to discover projects where mutual participation would benefit the Africa-based project but also build opportunities for participating US and Chinese agribusiness partners. The rise of the Chinese consumer has been one of the most important drivers of change in global agriculture in the last 25 years, and that process is only beginning. Combined with the emergence of middle class food consumption habits across emerging markets, the resulting demands on agricultural production systems represent among the most important economic and environmental challenges of the next 50 years. To meet these challenges, these four models represent opportunities to link investment activity in agricultural innovation—and connect the agricultural innovation engines of the two countries at the center of global agriculture. You cannot modernize the economy in Africa without starting with agriculture. Projections of a 9 billion global population and its need for doubled food production by 2050 are cited often, becoming the common language of the challenge and opportunity facing the global agri-food system. Nowhere is that challenge more vivid than in many parts of Africa. On the one end of the value chain stands consumers, with an emerging middle class in many African countries now demanding much more from agriculture and the food industry. There are now more than 50 cities in Africa with more than 1 million populations, some exceeding this mark substantially. I’ve visited four of those cities in the last three weeks in Dar es Salaam, Tanzania (4.4 million), Accra, Ghana (4.0 million), Kumasi, Ghana (1.8 million), and Kampala, Uganda (1.97 million). These metropolises are part of Africa that is projected to grow to a 2050 population of 2 billion people, double that of today. Proliferation of fast food restaurants, a sure sign of emerging middle class affluence, is lacking today in most of Sub-Saharan Africa, though there are some chains from South Africa present. A friend works with the owner of the first three Subway restaurants in Tanzania and Kenya. Three! I saw a KFC store in Accra, and a billboard advertisement. However, not a Starbucks in sight. No McDonalds either. Even without these global brands, there are many more local restaurants than you would have seen three, five, or ten years ago and supermarkets that carry a variety of local, regional, and global brands. On the other end of the value chain is where the challenge lies, agriculture. The systems of efficient agricultural production, processing, and logistics present in other parts of the world have largely not emerged as yet in most of Africa, but need to very quickly. There is much public sector and NGO activity related to development of agriculture, but what is lacking is private sector competition, innovation, and subsequent wealth creation. Imagine you are a native of a country in Sub-Saharan Africa and an aspiring Ray Kroc (McDonald’s founder), someone who wants to create a number of restaurants that specialize in quick-serve, high quality, consistent food items. You’re confident in demand so long as you can create the right atmosphere and serve high quality items at an affordable price. You begin to think about supply of key ingredients, and start with ground beef. You research beef products available, but find out there are only 3 beef abattoirs in the entire country where you want to launch, none processing more than 200 cattle in one week. After visiting them, you have serious concerns about basic safety and quality control standards. You then decide that perhaps imported beef, from the U.S., EU, or Brazil, is an option for higher quality, consistent beef products. After discovering the high per kilo price of imports, however, that doesn’t seem realistic for a start-up restaurant that aims to have price points for the masses. You turn to research about beef production in your country. Maybe there is a source of high quality cattle and you can create an alliance with them for processing the animals. After some research, you find out that there are no feedlot-style cattle producers in the entire country. Zero. We use the term ‘value chains’ a lot in agriculture and food industry. Value chains are the set of actors and activities that bring a basic agricultural product from production in the field to the consumer. The challenge in Africa is not just development of value chains, it is creation of value chains from the bottom-up. It is extremely difficult for someone from the U.S. or another country with highly developed agriculture to appreciate the task. Those who want to see production of various agricultural commodities and food ingredients can’t set their sights on just one value chain activity. You can’t plop a Midwestern crop production operation down, for example, as there is no developed market and logistics for all that it could produce. You can’t create a meat processing business because there is no modern packing facility to source meat from and there are few livestock producers of scale to provide the basic input anyway. The missing element has been value chain entrepreneurs, those willing to build entire value chains with all the associated problems and pains in doing so. The market wants high quality, consistent ground beef, for example? A value chain entrepreneur will do what it takes to deliver that product to the market place and it will likely involve level of direct investment and partnerships in beef production, beef abattoirs, beef processing, and cold chain logistics. There is simply no other way. The value chain will, of course, develop over the course of time, and entrepreneurs and companies will become more specialized in more specific parts of the value chains. But for now, it all needs to be done. I have had the opportunity to meet during my most recent travels (and prior travels to Africa) the value chain entrepreneurs that will make good things happen. Perhaps fittingly, I think the most interesting projects are those where farmers are involved. Sometimes farmers from abroad, the U.S. and Brazil, for example, partnered with someone they’ve met from Africa. Other times, it’s African farmers who are developing their operations beyond production agriculture and into processing, wholesale, and retail activities. Sometimes, it’s agribusiness people coming back to start their own operation, or young professionals returning to near their home villages to develop their own agricultural businesses. Capital is needed to develop entrepreneurial value chains in African agriculture, but there are two types of capital to keep in mind. One, certainly important, is financial capital. Scalable agricultural production, processing, and logistics simply cannot be developed without financial investment. Secondly, and I believe more important, is human capital. What is desperately needed is the human talent and spirit that can gather resources, identify opportunities, overcome obstacles, and build companies that will ultimately deliver affordable, high quality commodities, ingredients, and food to the emerging consumer base in Africa. That is, entrepreneurs. 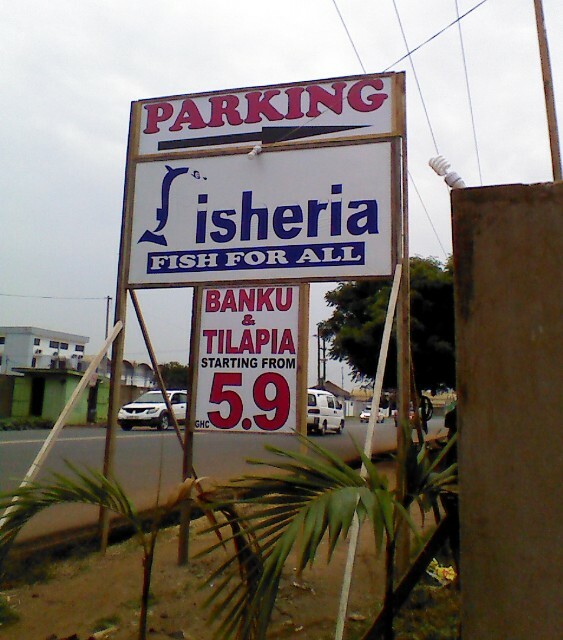 Farm to Fork – Raja Najjar’s Talapia Restaurant, Accra, Ghana. Farm raised fish offered directly to consumers starting at 5.90 cetis or $2.45 per plate. I recently returned from an extended trip across various parts of China, with most of my time spent evaluating agricultural opportunities. On my return this week, a student stopped by my office to ask about the trip and the conversation turned to economic growth. Why does China’s economy grow annually from 8 to 10 percent and the U.S. economy struggles to grow currently at even 2 percent? Economic growth, or wealth creation, at its core is about increased productivity, the ability for each of us to produce more with our time. Adam Smith got at this in 1776 in The Wealth of Nations. To take an example, therefore, the trade of the pin-maker; a workman not educated to this business, nor acquainted with the use of the machinery employed in it, could scarce, perhaps, with his utmost industry, make one pin in a day, and certainly could not make twenty. But in the way in which this business is now carried on, not only the whole work is a peculiar trade, but it is divided into a number of branches, of which the greater part are likewise peculiar trades. One man draws out the wire, another straights it, a third cuts it, a fourth points it, a fifth grinds it at the top for receiving, the head; to make the head requires two or three distinct operations; to put it on is a peculiar business, to whiten the pins is another; it is even a trade by itself to put them into the paper; and the important business of making a pin is, in this manner, divided into about eighteen distinct operations, which, in some factories, are all performed by distinct hands, though in others the same man will sometimes perform two or three of them. I have seen a small manufactory of this kind where ten men only were employed, and where some of them consequently performed two or three distinct operations. But though they were very poor, and therefore but indifferently accommodated with the necessary machinery, they could, when they exerted themselves, make among them about twelve pounds of pins in a day. There are in a pound upwards of four thousand pins of a middling size. Those ten persons, therefore, could make among them upwards of forty-eight thousand pins in a day. Each person, therefore, making a tenth part of forty-eight thousand pins, might be considered as making four thousand eight hundred pins in a day. But if they had all wrought separately and independently, and without any of them having been educated to this peculiar business, they certainly could not each of them have made twenty, perhaps not one pin in a day; that is, certainly, not the two hundred and fortieth, perhaps not the four thousand eight hundredth part of what they are at present capable of performing, in consequence of a proper division and combination of their different operations….The division of labor, so far as it can be introduced, occasions, in every art, a proportionable increase of the productive powers of labor. China’s economic growth rates are high because it can adopt the pin-maker’s technology, among countless others, that were developed over decades in other countries and implement them in a relatively short period of time. China’s economic ‘pie’ continues to expand rapidly, not because wealth is somehow taken from another country, but because of rapid productivity gains. At the heart of labor specialization is freedom for individuals to exchange. It is through exchange, individuals trading with one another, that labor specialization has continued to evolve. Labor specialization, in turn, leads to innovation. When an individual specializes in something, they develop a deeper knowledge of how to do it well and also how to improve over the course of time. This improvement, whether making pins, growing corn, or producing chicken meat, is innovation. Why do individuals take an interest in innovation? At a basic level we like to innovate to make our lives easier, to make more money, and ultimately to save time. Time saved equals labor productivity equals wealth creation equals economic growth equals prosperity. Today in developed countries (U.S., western Europe, Japan) the ‘average’ consumer spends their income in the following categories. Prior to economic opening-up, the ‘average’ Chinese consumer may have spent their income in a vastly different way. Individuals in China are in a relatively fast transition from the latter to the former. At it’s core, this is what 8 to 12 percent economic growth in China for the last twenty years has been about. Is there an inevitable end to the process? No. While there may be an end to the process of China’s transition to a modern economy at breakneck speed, the low-hanging fruit for economic growth, there is no inevitable end to the process of innovation and improvement, in China, the U.S. or anywhere else. The key element to continued innovation, however, arises from freedom of individuals to exchange. Exchange of goods and services is certainly important, but more important is the exchange of ideas. Free exchange of ideas, the intermingling of knowledge, leads to the next marginal improvement and innovation. Why does trade between China and the United States matter, or between any countries really? It matters because it is part of the specialization, innovation, and economic growth framework. The ability of individuals from two countries to exchanges goods, services, and ideas leads to economic growth. Trade restrictions may be in the short-run interest of a particular group seeking shelter from competition as well as the politicians representing it, but are most certainly not in the interest of individual consumers and the general public. Trade restrictions are economic growth inhibitors and wealth destroyers. Trade between China and the U.S. in 2011 was $504 billion according to the Department of Commerce. The list of goods that make up that huge number reflects the comparative advantage of each country, with China’s shipments to the U.S. being dominated by goods that are produced using China’s relatively less expensive labor and leading U.S. shipments being comprised of agricultural products and technology-based products. Greater specialization by producers of these goods in each country will lead to productivity gains over the course of time and subsequent wealth creation. I’ve met business people from both the U.S. and China working on shipment of products, exchange of services, technology trade, and the sharing of knowledge and ideas. This is important work for individual businesses, but part of the fabric of future economic growth for both countries.